Hey folks! There's a lot of excitement in la casa de Katie today! 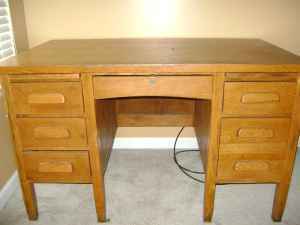 My antique harlequin desk sold! It was rainy here today so I brought the desk into my living room for her to look at. She walked in and stared at Barney, then asked if it was for sale too. Why yes, actually, I just put it on Craigslist yesterday! She wanted BOTH! SOLD! The icing on the cake? She just moved here two days ago from Rome (I know, right!) and now the only furniture she has is the desk, dresser, and a bed! She asked if I would like to refinish some more pieces for her empty home! Would I?! Please and thank you! So now that I have the money and space, I'm going to refinish a dresser for that spot. I just called today and left a message. But I'm hoping this little beauty is still available. If so, it's going to be my new dresser/buffet in the living room! I have big plans! In addition to this dresser, I'll be working on this little cutie for a friend who just bought her first home Friday! Orignially she was interested in my harlequin desk, but we decided to sell that and refinish a custom desk for her new home! This desk fits her personality perfectly! As long as the dimensions are appropriate this baby is ours! Next, I have a BRILLIANT idea for my antique door! I'm sooooooo excited! I think you all will love it too! Let's just hope it works out how I have it in my head! 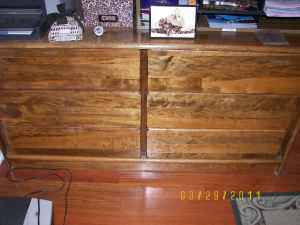 And lastly I'll be refinishing a dresser for my mother-in-law. Her birthday was this past Monday. There is a second larger dresser that I told her I would refinish for her Christmas present! I love getting to refinish furniture for gifts! It's cost-efficient for me, custom for whomever gets it, and functional! It's win-win for everyone! Needless to say I'm overjoyed right now! Mama needed some money (being a grad student aint easy) and now I finally have a ton of fun projects and some cash flow! Just in time for break! I'll be crazy busy, but I'll be busy doing something I love, not studying! I knew you'd sell it!! Congrats! Two pieces!! And to an awesome chic lady from Rome? Couldn't go to a more awesome home! So glad you got a new "client". Hurry and finish your finals so you can party! Very cool ... how exciting! OMG. Take a breath!!! I can almost hear your exasperation!!! (sp?, lol) So happy for you and your success!! My yellow console table is happy for you too!!! Can't wait to see all the new projects! Good for you! That is awesome! You should be proud, and happy and excited, lord knows I would be! Thanks ladies! I'm super excited! !